Faith No More have hinted that they could be about to start work on new material. A tweet on the band’s brand new, official Twitter account seems to suggest something is on the horizon and has sparked a flurry of excitement among fans. It was accompanied with a black and white selfie of frontman Mike Patton. 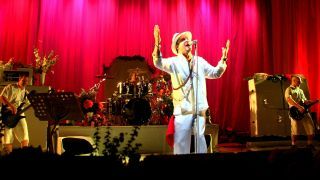 Faith No More reformed in 2009 after an 11-year hiatus, but Patton has previously strongly suggested that new material was not part of the plan. They play London’s Hype Park with Black Sabbath, Soundgarden and Motorhead on Friday, July 4. Faith No More’s last record was 1997’s Album Of The Year.